My name is Rob Ford and I have been working with Upper Deck for over ten years. My current role with the company is that of a sports coordinator and part of my job besides creating checklists is acquiring key components for certain brands. 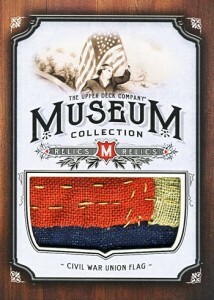 In 2011 Goodwin Champions the “Museum Collection” cards featured a variety of artifacts like a chair from Napolean and wood from the White House. For 2012, our hope was to focus in on one historic period for this insert series and with it being the 150th anniversary of the Civil War, that seemed to be the perfect period for Upper Deck to target. I am a huge aficionado of history so it was really exciting for me as I began to work with vendors to acquire authentic artifacts from the Civil War we could preserve and celebrate with the “Museum Collection” series. It was my goal from the start to respectfully show each piece and to minimize any damage to the pieces that may come during the production process. Therefore when first approached with the idea of doing flag cards from a vendor, I shared that we wanted to pass. However, once I saw pictures of what was left of the Union battle flag that was being sold in pieces, I agreed to take a look at the flag in person. Perhaps if Upper Deck were to use it in the set, we could give it a second life by presenting it in an attractive fashion and sharing it with history lovers. Once the flag arrived it was in a sad state both ripped and cut. The pieces missing had already been cut by the vendor and sold. The stripes were already cut away and all that was left was a narrow strip of red, white and blue. The process of cutting the flag to share with other collectors had already begun and I realized it would continue even if Upper Deck wasn’t involved in acquiring the piece. 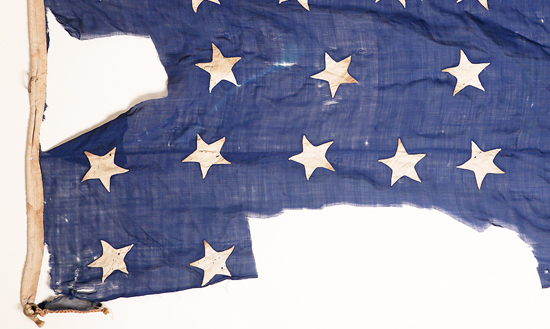 The flag was in fact so fragile that some of the rips became larger with every handling. Does it belong in a museum? Based on the current condition of the flag, I couldn’t imagine it would be something that anyone would want to see. Looking at it in this condition made me sad that it had not been better preserved. Still I had my reservations about altering it further. This is a portion of the actual Union battle flag Upper Deck procured for use in the 2012 Goodwin Champions “Museum Collection” series. The vendor was in the process of cutting it and selling it off. The overall condition of the flag was very poor. After much thought and weeks of discussion which included talking to a history professor from the Universityof San Diegoand number of veterans. From these discussions I learned that it was common for soldiers themselves to cut up their own flag for souvenirs. We all know there are proper ways to dispose of a flag, but this was not a flag that was accidentally left out in storm on a long Fourth of July weekend, this is an artifact that people should see. I began to think not only could we do this, but this might be something that we should do. My position here at Upper Deck sometimes gives me a chance to do things that people will enjoy and appreciate. Sometimes it is rewarding a deserving player by including them on a checklist or acquiring unique new memorabilia to be used in a memorabilia card, but I had never had an opportunity like this to help preserve an item by actually altering it and presenting it in a new way. This is the actual card we created that I believe gives this flag a new lease on life with the attractive presentation of the artifact. This piece came from the stitching, not shown in the image above. Finally, it came down to not the bottom line. It wasn’t about creating buzz and it certainly was not profits on the product, but just one simple thing; I had the opportunity to save this piece from slowly disintegrating and to make something to honor our veterans, not disgrace them. As an organization we hoped we could create something that would be collected and cherished by patriotic Americans like myself. And because of that we moved ahead with the project. Our intention was never to upset any veterans or patriotic Americans. Upper Deck has a strong heritage as one of the only trading card manufacturers who actively partners with military charities like Operation Gratitude. We know there are a lot of men and women in the military who are collectors. In fact, we even created a different insert series in the product paying tribute to the “Military Machines” used by our armed forces. As an American company we look to celebrate the men and women who have served our country, not disgrace them. For those who were upset about the decision to use this flag in the product, I apologize, but I do believe it was the right thing to do. So many collectors will get to experience and appreciate this artifact, in fact the professor we brought in shared he hoped to use one of the cards in his class with his students. For that reason alone I was encouraged to proceed with the use of this flag. I understand and appreciate people’s strong feelings on this issue and again I am sorry to anyone who may be upset by the use of this flag in this set. Our intention was to honor this flag, never to desecrate it. Kudos to you Rob! I have been a Civil War buff all my life and I thank you for sharing this piece of history with us. No matter what you do there is always going to be detractors. I hope I can get one of these to put with all my other Civil War collectibles I have found metal detecting and that have been passed down through my family. Just to imagine of my ancestors may have fought under this flag and I have it my hand to pass down to my generation is awesome. Thank you again! nice job to all at upper deck. i agree, that this was a good way to presurve what was left of a historical flag. now, just to aquire one. Glad you guys took the time to think this through. The end result are some pretty cool cards/keepsakes. At first hearing, this sounded horrible. But after reading that the flag was already mostly gone when Upper Deck got it, it seems like the only thing you can do with it is spread around what’s left, with a detailed history of the flag on the card. It was a tough choice, but it’s better than leaving it in a drawer in the basement of a museum. I believe that this was a great way to Honor and preserve the remaining fragment of this Flag. I also hope that at some point I can add one or more of these cards to my collection. Thank You. Does anyone know how many of these cards were made? ?